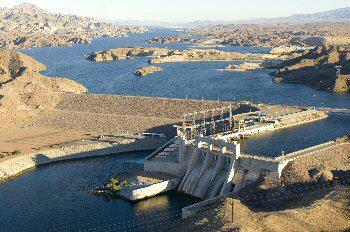 Davis Dam, originally known as Bullhead Dam runs 70 miles from Hoover Dam on the Colorado River. It is right on the Arizona and Nevada border. Davis Dam was renamed in honor of Arthur Powell Davis for his service to the US Bureau of Reclamation from 1914 to 1932. The US Bureau of Reclamation ran and operated the dam since its completion in 1951. Davis Dam is an earth fill dam consisting of a concrete spillway. At the crest its length is 1600ft and 200ft high. It is earth filled on the Nevada Side and on the Arizona side there is an inlet created by earth and concrete, there is a spillway at the end of the inlet. Perpendicular to the dam there is a power plant which is quiet an unusual and unique design. 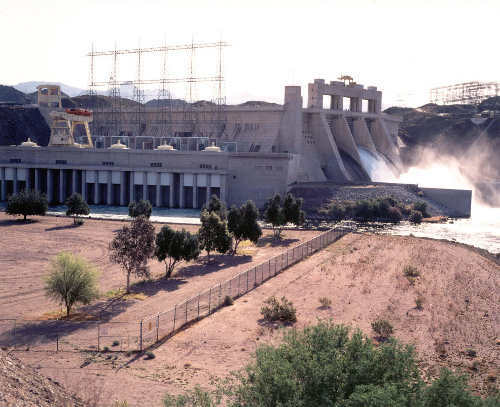 The Dam’s main purpose is to re-regulate water releases form the Hoover Dam this enables the Colorado River to supply water to Mexico, Bullhead City, Laughlin, Nevada and Arizona. These places are all located below the dam along the Colorado River. Davis Camp is located nearby as is Bullhead City where the construction workers resided during the construction of Davis Dam. Arizona State Route 68 originally stretched out across a bridge that spanned the earth filled portion of the dam and inlet. In 2004 the highway was rerouted away from the dam and a further distance from the power station, which helped increase the security of the power station. This upgrade also increased the lanes of the highway. At the same time barriers were erected on each side of the dam to prevent the access of vehicles however pedestrians are not denied access to the dam. All other roads are open to traffic. On the Arizona side of the dam there is the Davis Dam Power Plant. As a hydroelectric Plant it generates anywhere between 1-2 terawatt hours of electricity annually. The maximum capacity of the Davis Dam Power Plant is 251 MW. The Davis Dam Power Plant's head (the tallest point) is 136ft high, it and the five turbines (aka Francis turbines) are very prominent and can be easily seen from a distance.